I'm hoping to make it down to the BHPC race at Hillingdon on the 5th of May. 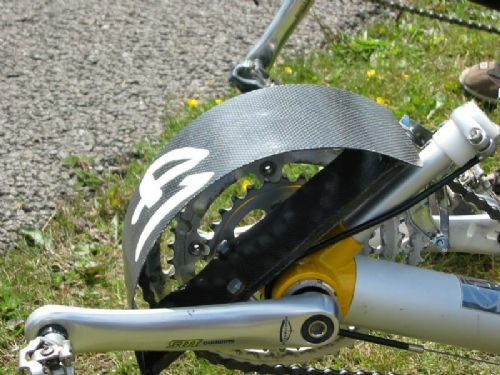 I've been reading the guidance on the "How to race with BHPC" page, specifically regarding the necessity for a chain guard to be fitted in order to race. 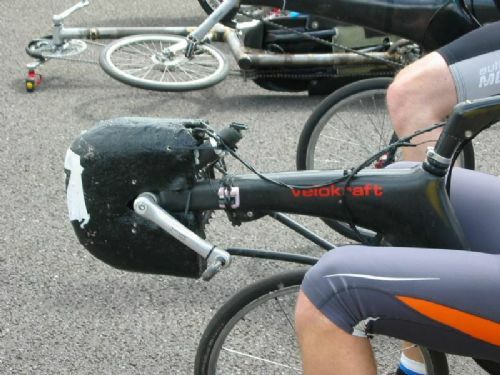 My bike doesn't have one of these, and it feels buying one will be easier that trying to make one. I'm wanting to check that something like this would be OK before investing. I've attached a photo of the chain ring on my High Baron, looks like it's compatible. Has anyone got any experience in fitting these? looks like I can just bolt it over the top of the 50 tooth ring on the spider. I guess I may need to move the derailleur back to fit it in. Any thoughts appreciated and hope to see you down there! You weren't able to post pictures earlier as all new accounts are "moderated" because we've had spam issues in the past. I've changed your status now to "visitor" (if you're a BHPC member please let us know and we'll add you to the member's group). All we need is something to prevent any pointy bits from stabbing other competitors or innocent bystanders. Look forward to seeing you at Hillingdon!! Thanks Alan, hope I can make it down! BTW, rather off topic - I'm not currently a BHPC member. Can I just turn up on the day, pay the £10 race fee in cash, register for the race and pick up race number there and then? or do I need to do anything in advance? Yes, you can just turn up and we'll give you a number on the day - If you are definitely coming, let us know before and we can allocate a number so that you can stick it on your bike before you arrive. Members race for £7 and get the club magazine, so if you are doing two or more races then membership (at £6 if you only want PDF versions of the magazines) is a bit of a no-brainer. You will be able to join at Hillingdon or online via the shop if you wish. Ok, so after talking to a local bike shop it sounds like the chain guardI put in my previous post don't work well with racing cranks and can interfere with the derailleur. I don't know if anyone has experience of fitting one of these style of chain rings? So as I am fairly handy with CAD, my plan B is to 3D-print something similar in style to the attached which I have taken from the BHPC chain guard gallery. My question is this - would this acceptably safe if printed in thick PLA plastic? No idea what they are on about (and I suspect they havn't got a clue either). Anything that covers the pointy bits will be ok as far as the rule goes but beware if it's too thin/flexible the wind will blow it against the chainring once you get up to speed.